How is it that it has already been a whole week since Thanksgiving Day? 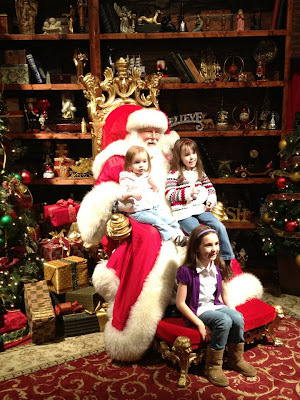 As I get older and my kids get older, the Holidays seem to go by so much faster than they used to! Maybe it is because there is so much more to do for them when you have kids. Even though we were insanely busy, we had a wonderful 4 day holiday this year. It was filled with visits from family and dear friends-both in person and on Skype. It is definitely one we will always remember. 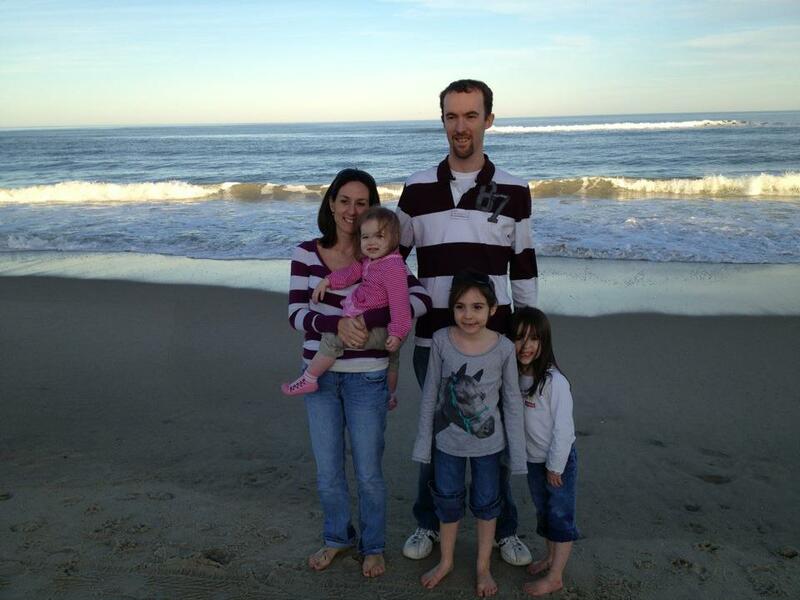 This year, for the first time, we got to see ALL of our nephews and our niece for Thanksgiving. We have 4 nephews ranging in age from 2-13, and one niece who is graduating from high school this year. 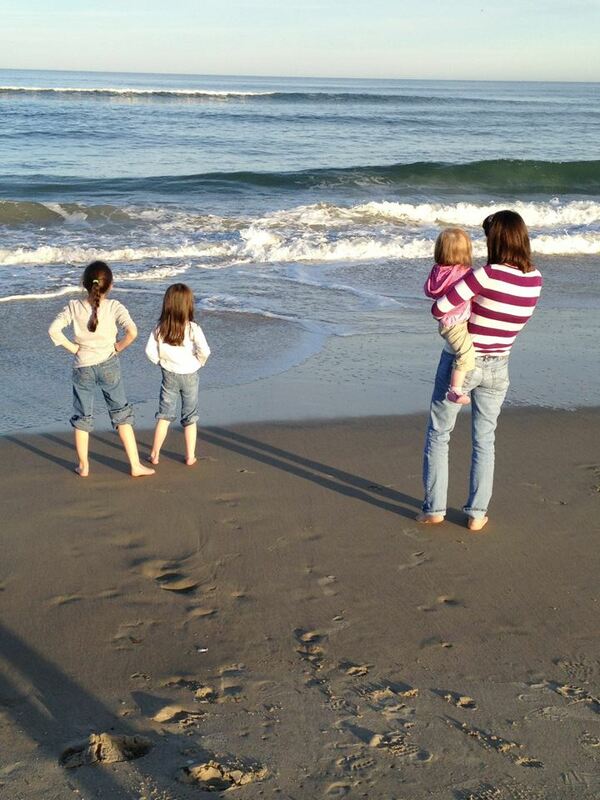 My girls absolutely ADORE their oldest cousins! We don't get to see them often because we live so far apart. But this year we have gotten to see them 3 times already, and that is definitely something my husband and I are so very thankful for. Our oldest nephew actually spent 4 days here at our house because his girlfriend happens to be my best friend's oldest daughter(long story). So she also spent most of the week with us, which we loved. She is an awesome kid. The kids seemed to have a good time putting "Gobble Gobble" together. He didn't look exactly like the picture, but that's ok:-) They had fun and that's all that matters! I tried to find something other than cheese to use, and we thought about Cantaloupe but it's out of season, and with the recent recalls and health issues I am not about to buy precut grocery store melon to eat. (Ours comes from our CSA). Friday we had the brilliant idea to go to Christmas Town at Busch Gardens. (If you've never been- Busch Gardens is an amusement park and their theme is Europe. It's broken down into countries: they have England, Scotland, Ireland, France, Germany, Italy, and New France AKA Canada. For Christmas they decorate the entire park with lights, add special shows and Christmas food, and have special events. It really is a great time! We thought that since most people would be tired from Black Friday shopping the park wouldn't be that busy. Boy were we wrong! It was a ZOO!! In fact, it was so busy that by 5pm that had to close the gates because they were at capacity. We were already in the park by that point. 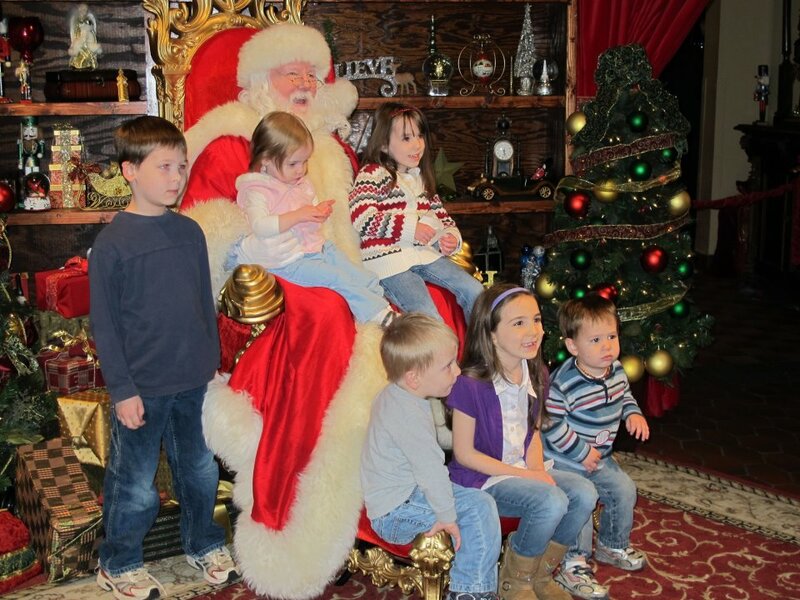 Mom wanted a picture of all 6 grand kids with Santa (and BG has the best Santa around!). We waited in line for 45 minutes, with SIX kids under age 8. By about halfway through I pulled out the Goldfish crackers and dispensed them one by one to each child. That kept them busy, entertained, and fed. For as cramped as we were, the kids did awesome! 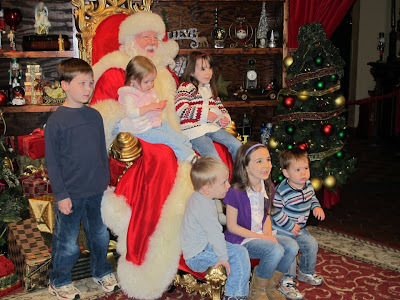 Santa was very patient, the kids all cooperated, and we managed to get a great picture of all them. Saturday the plan was to drive down to the Outer Banks to take our oldest nephew back to his parents, who were spending Thanksgiving at their beach house. We always love going down to the Outer Banks, even if it's just for the day. Since the weather was amazing that day we made sure we spent a little time down near the water. My idea of Heaven on Earth. Even though it was cold, we had to get our feet wet! It wasn't that cold actually. Before dinner we went up to Jockey's Ridge to see some kites lit up with Christmas lights. Jockey's Ridge is a huge sand dune in the middle of the Outer Banks and is a great place for flying kites or to just get amazing views of the Atlantic Ocean and the Sound. It was a busy whirlwind of a weekend that went by entirely too fast. But we have some great memories, and my girls will always remember this year. This year, and every year, I have so much to be Thankful for. Duxelle???? What the heck it that? I'm glad you think my kid is awesome. Duxelle sauce is made from minced mushrooms, onions, shallots, herbs, and a good white wine, and then used as a stuffing. In this case, Andy used it to stuff a pork loin. And it was delicious!